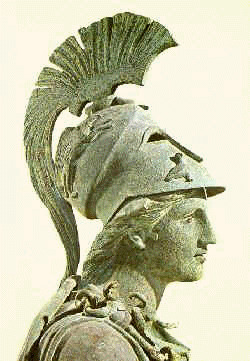 Athena (the Romans called her Minerva) was the goddess of both war and wisdom (intelligence). She was also the protector of heroes, cities, and civilized life as well as patron of the arts and agriculture. Odysseus, hero of The Odyssey, was among her favorite humans. Athena was the daughter of Zeus and had no mother as she sprang as an adult from the head of Zeus. She is usually shown wearing a helmet, carrying a spear in one hand and a shield in the other, and wearing the aegis (a protective breastplate made of goatskin and fringed with snakes which produced thunderbolts when shaken). The aegis was worn only by Athena and her father Zeus. The Parthenon on the Acropolis in Athens, Greece, was the temple of Athena.